Freeport - Close to one hundred people came out to the Garden of the Groves as the full moon was rising in the sky on December 21st to enjoy and participate in Joie de Noel on and around the Grand Bahama Labyrinth. Freeport, Bahamas - The big Beaver Moon on Saturday evening lit up the Grand Bahama Labyrinth for a celebration of life in song and dance. Freeport, Bahamas - The Grand Bahama Labyrinth Garden Theatre Season is opening on Saturday 20th November with, once again (for the third year!) another colourful Elden-McGlone production! Each of these shows seems to top the last, so I am sure we are looking forward to an evening that really lives up to its name Joie de Vivre! 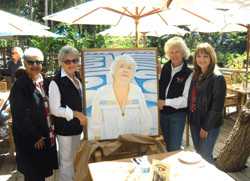 A celebration of LIFE and of Living! Freeport, Grand Bahama - A Walk for Peace, in light of Remembrance Day will be held at the Grand Bahama Labyrinth on November 11th at 11am sharp. 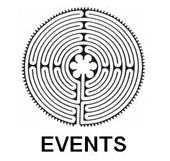 Barbara Chester, Founder of the Labyrinth invites those who feel drawn to our simple gathering next week, to come to the Labyrinth in the Garden of the Groves just before 11am when we will silently 'Remember them', Pray and Meditate on Love and Peace in our World. Freeport, Bahamas - Sunday evening, 30th of May, all enjoyed a warm and wonderful finale to the Labyrinth Garden Theatre Season with the presentation "Moods at Twilight". In welcoming a truly appreciative audience (ranging from 8 weeks to 80 years...and three theatre-going dogs!) Barbara Chester reminded everyone that the Labyrinth was not yet two years old but was already occupying an important place in the community where it was proving to be a great blessing. She commented that, as a beautiful gathering place of pure energy in the lovely Garden of the Groves it has provided a unique venue for our young up-and-coming entertainers of the future; many of whom we were delighted to see that night. Barbara remarked how great it was to see more of the community understanding and appreciating the Spirit of the Labyrinth and all it has to offer! Freeport, Bahamas - The Grand Bahama Labyrinth at the Garden of the Groves is pleased to present the Eldon-McGlone Production of "Moods at Twilight" on Sunday, May 30th at 6:30pm. The show will feature music and dance on the Labyrinth. Tickets are $10.00 for Garden Members; $15.00 for non-members (the extra $5.00 is for entry to the Gardens) and $5.00 for children under 12. Freeport, Bahamas - Families and students preparing for Graduation, please join us to "Focus 4 A Better Tomorrow" on Saturday, May 29th at 11 am on the Grand Bahama Labyrinth at the Garden of the Groves. The first in a series of special events for Students during the stressful days preparing for Graduation. We have designed a happy, calming & inspirational programme with word, music, singing and interaction with each other and with your God.. 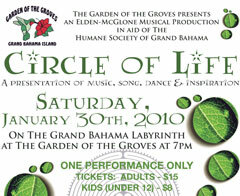 Check here often to find out what is coming up at the Grand Bahama Labyrinth in the beautiful Garden of the Groves. The Grand Bahama Labyrinth is a wonderful place to unwind, seek solitude, meditate or pray, OR enjoy a community event! Freeport, Bahamas - It was good to see most of the entrants together with members of their families and other supporters at the charming little prize giving ceremony on the Labyrinth on Friday 23rd April, also Shakespeare's birthday! Freeport, The Bahamas - The Garden of the Groves and the Grand Bahama Labyrinth are pleased to announce their 2nd Annual Photographic Competition for Young Persons. The contest is set to commence on March 28th. Photos must be taken between March 28th and April 16th. AND each photo must be accompanied with a quote from Shakespeare as the prizes will be given out on Shakespeare's birthday on April 23th on the Labyrinth. Barbara writes, "It was an enormous honour and with great joy that I was able to follow my path and create a Labyrinth in the Garden of the Groves. I have been very blessed with enormous loving guidance from my Creator, help and support from my friends and fellow members of our Community and especially from my dear friend Erika Gates , in whose Gardens our Labyrinth has her home..."
Freeport, Bahamas - Saturday, March 6th on the beautiful Sacred Path in the Garden of the Groves a most appreciative audience were delighted by the magic of the ‘Evening with Marjoke and Friends’ who all performed from their hearts, vocalising the true spirit of the Labyrinth. Our Dutch Diva, Marjoke Twiest opened the show with a beautiful recital of "People", reminding us that life is all about....people! Freeport, Grand Bahama - Labyrinth Garden Theatre proudly presents “An Evening with Marjoke & Friends” a Dutch Divas Production at The Grand Bahama Labyrinth, Garden of the Groves. Enjoy the beautiful voices of Dalia Feldman ;Tony Lowe;Javan Hunt ;Stephan Lighters; Marjoke Twiest. 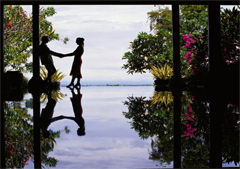 The incredible dancing of Julia Geiger; Lawson Pinder and Stephan Lighters… with spectacular. Fire Dancing by Stephan and Lawson. Grand Bahama, The Bahamas – Am I on The Bachelorette or is this a bad case of TV deja vu? 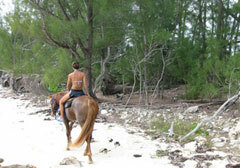 The pale aqua ocean, deserted beach and sleek black horse all look strangely familiar. My lithe female guide, Leo, the owner of Trikk Pony, confirms it. Secluded Barbary Beach on Grand Bahama, the fourth-largest island in the Bahamian archipelago, is where Bachelorette DeAnna rode horses with Jesse on The Bachelorette Season 4, and I'm about to re-create the ride. Freeport, Bahamas - Those who attended Circle of Life on the Labyrinth at the Garden of the Groves Saturday night enjoyed a lovely show, possibly the best yet, with some beautiful singing, dancing, poetry monologues, and a slide show of shelter animals which was beautifully accompanied by Marjoke Twiest’s rendition of “In the Arms of the Angels”. About 100 people were treated to a first class production with a great deal of professionalism helped by Darren Rollins working lights, sound and projection. 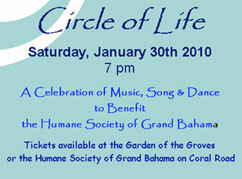 Freeport, Bahamas - In aid of the Humane Society of Grand Bahama, the Garden of the Groves is pleased to present Circle of Life - A presentation of Music, Song, Dance and Inspiration, Saturday, January 30th on the Grand Bahama Labyrinth. This year's Show promises to be even more entertaining than the beautiful show we watched last January on our lovely Labyrinth where the sacred energy added to the magic of the enchanted evening conjured up by that great duo - Ivy Elden and Gloria McGlone.